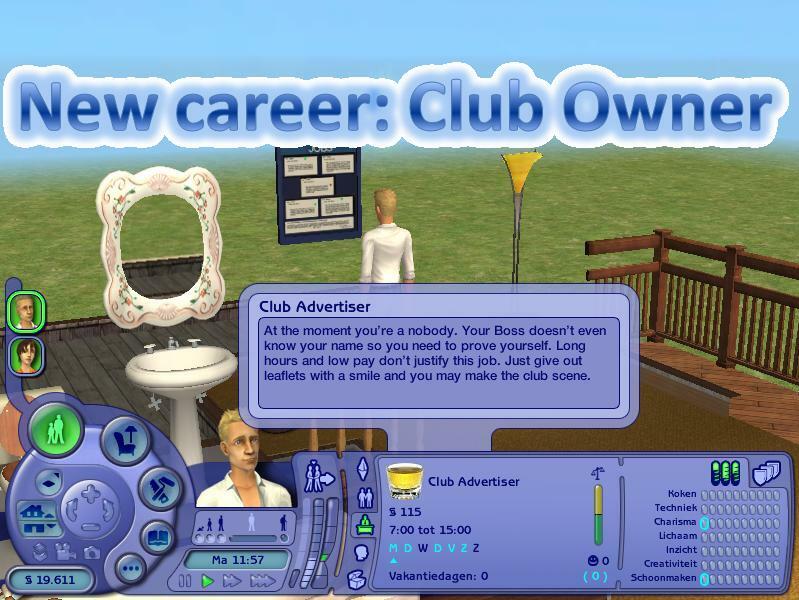 As I do take requests, Jack Newall requested the career Club Owner. Description At the moment you’re a nobody. Your Boss doesn’t even know your name so you need to prove yourself. Long hours and low pay don’t justify this job. Just give out leaflets with a smile and you may make the club scene. Description Welcome to club life. Whilst everyone else drinks and mingles you just need to keep your mouth closed and clean up after them. Cleaning skills are essential here. Do well and you may never see a dish again. Description This job may still involve dishes but at least you’re not cleaning them. As a waiter you must keep smiling and know when and when not to speak. The pay may still be poor but you now get tips. Description Decent pay and decent hours come with this nice little job. This job plays a vital role in club life as a good Bartender can make or break an owner’s career. Your drinks need to taste nice and look nice so be creative. This job comes with a lot of respect. Description You’re out of the club and you’re in the field now. You’re tasked with finding the best entertaining acts to perform at the club. Charisma is the key to persuading the acts agents to allow them to act cheaply in the club. No more late nights just early mornings. Description This job is a lot harder than it sounds. You’re in charge of booking reservations for guests. It may not sound hard but you need to make sure good tippers and celebrities are put in front of your average Joe. Therefore you must prevent the parties clashing reservations, if so the club will be sent into madness. Your Boss knows your name and you are well respected by the employees. There is a lot of pressure. Description Now you’re back in the club but instead of all the hard grimy work you present the acts. This job is not that hard and so long as you have a lot of charisma the crowd will stay interested (even if half of them are drunk). Description Security in a club is a major problem. You must make sure no unwanted quests get in or any brawls break out inside the club. The Bouncers do as you say even if it’s not very professional. You also have the honours of escorting the unwanted out of the Club. This job is Not very hard considering the wage. Description Once again you have been taken out of the bottom floor and instead been put upstairs in your own office. You are now in charge of the money earned by the club. You need to make sure that the Staff gets paid, the acts get paid and you need money to help the club keep running. If you can do this job you will have proven you can run your own club. Description No more will you be told what to do, clean dishes or spending long hours working. This is your club and you do what you want. Use your imagination and go wild. Theme your club however you want and charge what you want to. You’re brushing shoulders with the biggest names in Hollywood, the Countries best known politicians and the most respected members of the Mafia. There’s not much better than this. There is also a very big pay check at the end of the day. You are top of the roost now. Great idea! Thanks for creating it.